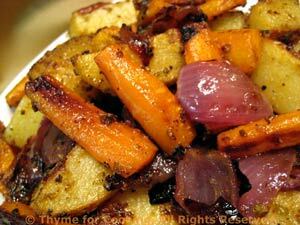 Roasted Onions, Potatoes and Carrots, Thyme for Cooking easy side dish. In the winter I do these in the oven; in summer on the grill. Either way, roasted/grilled vegetables are delicious, and, cooked with a minimum of fat, very healthy. Slice the carrots in half lengthwise and then in half or thirds the short way. Slice onion in half, then each half in thirds. In a medium bowl mix oil and vinegar. Add vegetables and toss well to coat. To Grill on barbecue: Put into 'grill pan' (a metal or foil pan dedicated to use on the grill) or onto a mesh grill pan (the idea is not to have the stuff fall through the grate into the fire....) Cook over medium heat 20 - 30 minutes, until vegetables have a nice color and potatoes are done. Serve. To Roast in oven: Put vegetables on a baking sheet with a lip or in a shallow roasting pan. Bake in 420F (215C) oven for 30 minutes or until done, stirring occasionally. Vegetables should be lightly browned and tender. Remove, sprinkle with sea salt and serve.